Elizabeth passed away March 27, 2019. She was born August 9,1928 in Wallau-Lahn, Marburg Germany. She met her future husband Gerald Glen Lewis who was stationed in Germany during WWII as a First Lieutenant in the U.S. Army at a dance.They married in Germany in 1952,then moved to the U.S. where she became a U.S. citizen. She lived in Boise, Idaho where son Brent was born several years later, then moved to Western Washington where daughter Marla was born in Seattle 2 years later. Her working life included dental nurse, Avon Lady for several years, then later in life worked as a Certified Nursing Assistant. 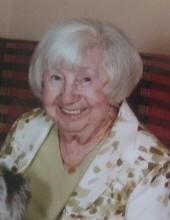 Her hobbies included knitting, her pet dogs over the years, baking, entertaining and involvement in her church. She is survived by her son Brent of Colbert, WA, daughter Marla of Spokane, WA and granddaughter Caitlin, also of Spokane, WA, and, also numerous friends who have been a great help these final years. To send flowers or a remembrance gift to the family of Elizabeth B Lewis, please visit our Tribute Store. "Email Address" would like to share the life celebration of Elizabeth B Lewis. Click on the "link" to go to share a favorite memory or leave a condolence message for the family.